Wasps in commercial premises are highly undesirable. They start nest building in the spring, the nests are initially about the size of a golf ball, rapidly developing to the size of a large football, or even a dustbin in extreme cases. 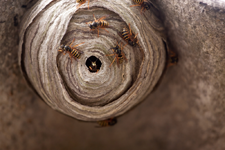 We are usually unaware of their presence until June or July when the large number of wasps makes the nest more obvious. In the late summer the adult wasps forage for sweet foods and can be a nuisance in restaurants, pub gardens, bakeries and factories handling sugar. 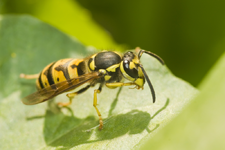 With expert pest controllers spread throughout Dorset, Hampshire, London, Somerset and Surrey we can quickly respond to wasp and bee infestations. Bees are highly beneficial insects and nests should only be treated where absolutely necessary. As part of the process the honeycomb should be removed and the access points sealed to prevent foraging by bees from other nests. Provide advice on the use of wasp traps to reduce wasp activity in pub gardens etc.